iPhone X OLED Display: Yes or No? The latest version of the iPhone is almost here. There are a lot of features and specification are revealed. It includes a new design and tons of new features including an upgrade to iOS 11 software, all these increasing the anticipation. The most amazing thing about the iPhone X from what the prototype shows is that there will be a deviation from the general iPhone design. These differences may include an absence of the home button and a vertical back camera. Another change expected from Apple with the latest release from the company is an OLED display. Apple would be ditching the LED display for an OLED display as part of their new design. OLED technology although more expensive is superior to using LED display. One of the reason is that it lights up on its own without relying on a backlight. It is also easier to use with augmented and virtual technology. Some of the prototype that has made it out so far features a new OLED display feature as there is with the Samsung newer models. From what the prototype shows there may be no curved OLED feature as with Samsung. For some reason, the curved screen has been gained popularity as there have been increased sales for the curved screen design. 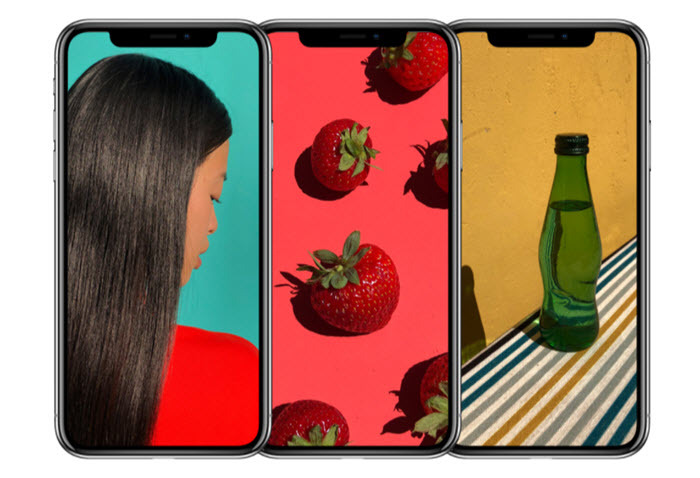 The iPhone OLED display is rumored to come with a regular straight screen, but work is still on to see if the curved screen can be incorporated into the newer iPhone designs. DigiTimes in April 2017, had reported that Apple would be signing a two- year deal with Samsung. This deal was for Samsung to supply OLED panels. The deal is rumored to be worth about 9 Billion dollars and is expected to have Samsung ship 70 -92 million OLED panels to Apple. This supply will represent 30% of all iPhone devices that will is expected to sell this year. As already stated the OLED display is superior to the LCD as it does not require a backlight. OLED displays can light up pixels when required. Another advantage of having an OLED based screen is that it has a brighter screen with relatively low power consumption. Well for some reason the OLED curved screen versions of the Samsung phone is one of the highest sold version of Samsung phones. Although there is no certainty that the iPhone X version is going to include a curved screen, an OLED screen is something to anticipate. Apple is quite confident about this also. They would not have entered into a multi-million dollar with the competition otherwise. In fact, an OLED based screen with a 5.8 screen display makes the iPhone X better than its previous versions. iPhone enthusiasts had better start saving, getting an iPhone this Christmas may be worth it. There are a few options for disposing of your old phone when you get a new one. You could donate it, sell it, recycle or sell the parts. Whatever you decide to do with it, you should protect your data. Our mobile phones have become part of our everyday use. You may not leave the house without your wallet/purse, keys, and phones. Even at work, it turns out more people use their phones at work as it is portable and allows for convenience. This usage means that you store a lot of data on your phone and even when you delete something they do not get completely erased. This means any one can retrieve that information if they try hard enough. You, therefore, need a software that deletes everything leaving no trace behind. iMyFone Umate Pro or iMyFone Umate Pro for Mac can be your privacy protector. If you are looking for a great private protector for your iPhone, then you should get the Umate pro. It is regarded as one of the safest iPhone data eraser. It enables you to erase IOS data after previewing what you want to delete. This iPhone data eraser helps you protect your privacy, stopping leaks by permanently deleting messages, call logs, and all Chats. Videos, photos, multimedia and any other private file without leaving an option or trace for recovery. Even when you restore your phone to factory settings, it does not completely erase your data. It leaves a trace behind that can be recovered by any recovery tool this however completely erases all data, leaving no trace even from the FBI. Third-party apps leave fragmented files behind that take up too much space. 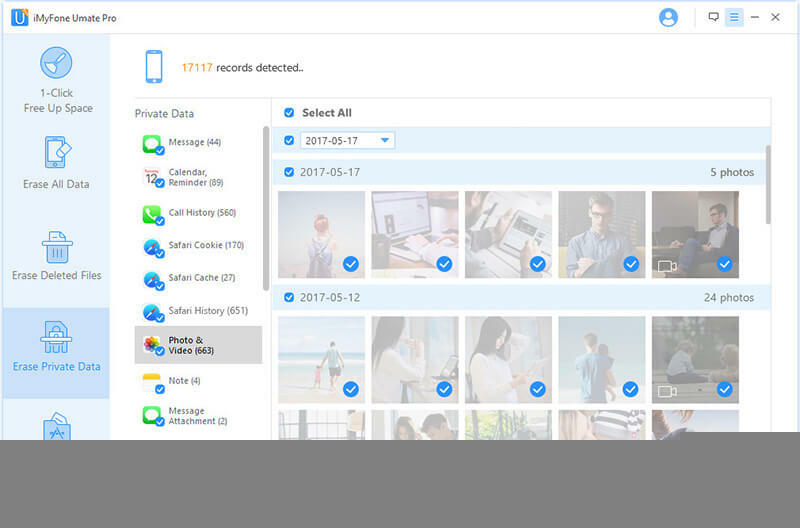 Umate Pro scans your device and clears up these files. If you need to clean-up your device your device so that you can get enough space, Umate pro is just what you need. It clears up junk files; cleans temporary files; export/compress/delete large files and photos. Uninstalls useless apps.